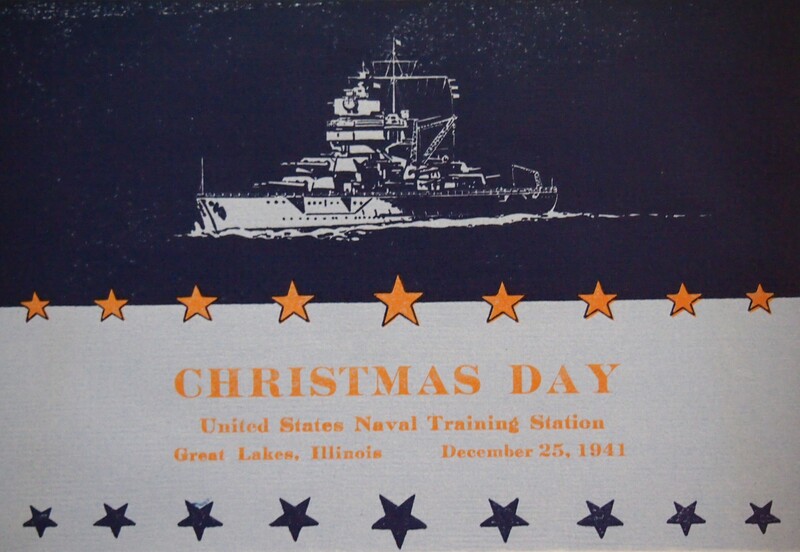 Inside this card from Christmas 1941 is a message from John Downes, Rear Admiral USN, Commanding. “It it my privilege and pleasure to extend Christmas greetings to the officers and men at the Naval Training Station and to their loved ones at home. During the coming year we will be bound together even more closely, by the united efforts of all, to defend and preserve our American way of life. The following page included a menu for the CHRISTMAS DAY DINNER at the US Naval Training Station. The back page listed Christmas Church Services. Those on Christmas Eve, December 24th for the Main Station included Protestant services at 2300: Candlelight Choir and Carol Service followed by celebration of Holy Communion, at the Drill Hall, Building no. 4. Catholic services were at 2400: Midnight Mass in the Auditorium of Building No. 3. Services on Christmas Day, December 25th for the First Regiment included Protestant services at 1000: Christmas Service, Drill Hall, Building No. 4. Frank Lash Captain, USN, Senior Chaplain. Catholic service also at 1000: Christmas Mass, Auditorium of Building No. 3. Additional Christmas Masses to be held at 0715 and 0915 in the Hospital Chapel. Though no personal note from Lester exists, he evidently was able to celebrate Christmas at the training station with other Navy personnel. The note from the commander echoed the tension felt across the country as troops and sailors readied themselves for battle in World War II. No doubt many prayers were lifted that Christmas season for peace on earth and a quick end to the escalating conflict around the world.